Over recent years, commodity traders still had the option of using pit trading or electronic trading platforms in several commodity markets, but that has changed. The ICE futures exchange has increased its presence in recent years, and it is entirely electronic — no pit trading. The old school thought is that pit trading is the most efficient form of price discovery, but it is hard to deny the benefits of electronic trading. So, which is better? Electronic trading offers much cheaper commissions for retail traders, and the transactions execute on a faster and more efficient basis than on the floor of an exchange. Once you trade an electronic futures contract, it is hard to imagine any better way. There was a time when you had to call a broker to place an order. The broker would then call down to the floor to an order clerk and the clerk would then relay the order to a floor broker. Upon execution, the floor broker would transmit it back to the clerk and the clerk would send it back to your broker and then your broker would give you a fill of your order and confirmation. The many steps of the process took at least a couple minutes to complete. In electronic markets, the whole process takes seconds. Perhaps the most attractive element of electronic trading for traders is that brokerage commissions are significantly lower on an electronic trading platform. It isn’t difficult to see why electronic trading has dispatched floor traders to extinction. Floor brokers attempted to make the case that they had the ability to arrange for better executions — meaning they were able to get a better price on orders, or buy lower and sell higher. Perhaps the most significant contribution of the floor broker was the ability for customers to speak with someone on the floor of the exchange that was constantly in the action and felt the pulse of buying and selling in markets. However, those days have ended. On the other hand, there were many examples of poor floor broker trade executions. Floor brokers had to make a living and at times, it was at the expense of the retail trader. Another thing to consider in the debate over pit versus electronic trading is whether electronic trading can handle turbulent times. It is hard not to forget the flash crash that took the Dow down about 1,000 points in a couple of minutes. Electronic trading was the cause of the flash crash. High-frequency traders are responsible for an increasingly larger amount of the volume on the stock exchanges. Many believe high-frequency traders manipulate prices much more than floor traders ever could. Day trading has become increasingly popular since electronic trading came on the scene. It is almost impossible to day trade without using electronic trading. It is another issue whether the world is better off with the introduction of day trading. For those who hold longer-term positions, there isn’t much of a difference between pit trading and electronic trading. The commissions are lower in electronic trading, but a good relationship with the right people on the floor can more than compensate for the commission savings. In the end, electronic trading has too many benefits. Perhaps the biggest benefit of all is the exchange consolidation and economies of scale created by electronic platforms. In theory, the savings are passed on to the ultimate customers of the exchange, the traders, hedgers, and other market participants. It is only a matter of time before the pits no longer exist. Floor traders built the commodity markets but times changed. The days of pit trading have ended. 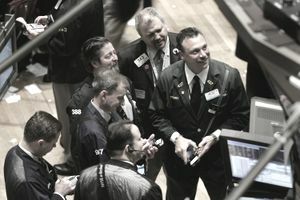 However, a few exchanges still have physical traders on the floor or located at the exchange. One example is the London Metal Exchange which still trades parts of the session in a ring which is synonymous with a pit. Electronic trading lowered costs and made it easier for oversight in these days of increasing rules and regulations.